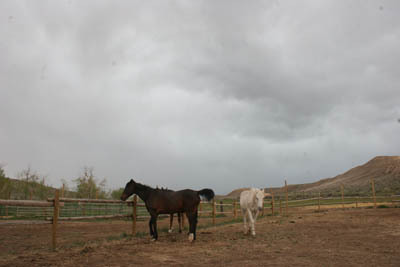 It's a stormy spring day in the high desert under the Owyhee mountains. Squall lines of storms move through all day long. Waves of sunshine, then clouds then wind then rain, then sunshine (time it right and you can squeeze in a ride). Always kinetic: weather on a mission. Sometimes there are cloudbursts. Sometimes hail. Sometimes thunder. But always moving onward. The kind of weather that produces flash floods. A particular cloudburst picks a particular canyon - with a wet or dry creekbed - to dump its load. It is so sudden and heavy and swift that the desert does not absorb the water. It becomes like a freight train rushing down-canyon. 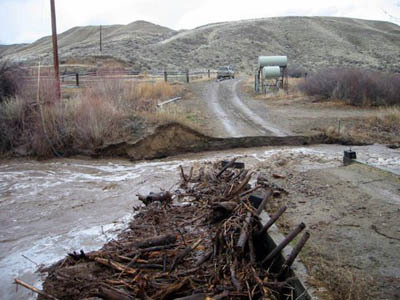 Twice in the last 8 years years a flash flood has swept away ours and the neighbor's bridges. The squalls start in the Owyhees: while it's sunny down here, 6 miles up-canyon dark blue clouds sink down to touch the peaks of the mountains. The clouds turn dark gray as they keep descending and obscure the whole mountain range. As the rain begins to fall in the mountains (and the snow, up high), the gray becomes lighter, almost white, a sheet, as it moves closer this way down Pickett Creek. Now here the overhead sky turns dark gray. The wind picks up. 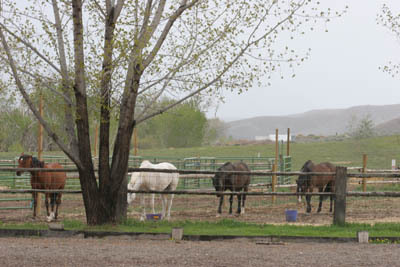 The geldings in the big pen leave the hay feeder, move to the corner of the paddock and turn their butts to the wind. 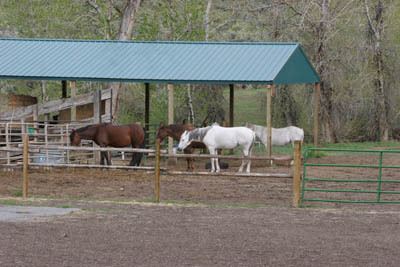 The mares, out grazing, run to the overhanging shelter of the hay barn (but Quickie hogs it and won't let anyone else under), turning their butts to the wind. The two boys in the Fat Pen back their butts up against the storage unit that blocks the wind. Rain drops start to fall. The white sheet reaches us. 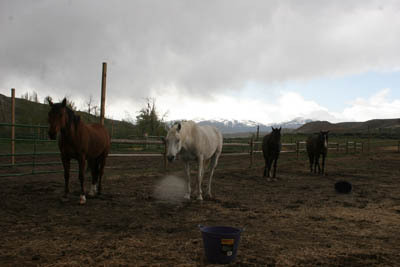 The horses drop their heads to the ground, adjusting their butts to take the brunt of the swirling gusts. The rain hammers down. It turns to hail. The horses keep their heads down, wait it out. 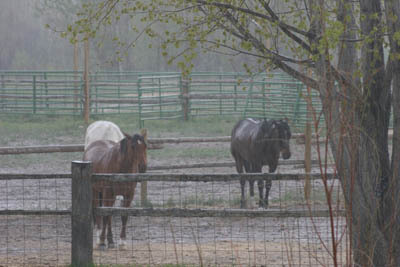 The hail passes, but for ten minutes, the rain continues pelting down, turning the ground into a brief sea. Behind, through the rain, the Owyhee mountains are emerging into sunshine accentuated with touches of blue sky. 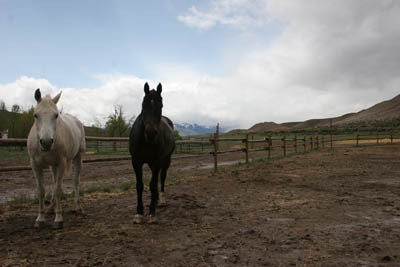 The Owyhees glow bright white with a new thin fresh layer of snow as the last of the rain sprinkles the butts of the horses; and as the sun slowly works its way down the canyon to here, chasing the line of dark clouds further north, the mountains once again become enveloped in a layer of clouds. The sun spreads over us, and on down Pickett Creek; the geldings return to their hay bale, the mares wander back up to graze. The mountains disappear again into deep blue clouds. This time thunder rumbles behind the veil (even I can hear it). The veil turns to gray, and then a white sheet again as the rain falls and works its way down here. The wind comes, the horses move to their hunkering-down positions. Another downpour works its way over us as the Owyhees emerge into the sun again. The ballet between Equines and Nature continues all day: Springtime in Owyhee.